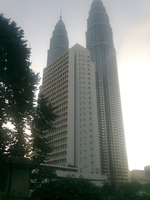 Aurora Tower (formerly known as Wisma Angkasa Raya) is a freehold office building located in KLCC, KL City Centre. It was developed by UEM Sunrise Bhd (fka Sunrise), and was completed around 1978. UEM Sunrise Bhd (fka Sunrise) is a gigantic property developer listed on Bursa Malaysia, and it has developed about 59 property projects in Malaysia. Other similar projects by the same developer are 11 Mont Kiara, Arcoris, Menara Solaris, Residensi 22, Serene Heights, Solaris Dutamas, Symphony Hills, Taman Nusa Idaman, Teega and Verdi. As for metro transport stations, there are LRT Dang Wangi, LRT KLCC, LRT Kampung Baru, Monorail Bukit Nanas and Monorail Raja Chulan. There are also some hospitals here, for example Al Islam Specialist Hospital, Specialist Hospital Al Islam and Twin Towers Medical Center.